I just posted [Monday Feb. 6, 2017] the following on my Face Book page: "Let's be honest here conservatives and Republicans. If Bill OReilly had asked the same question he asked Trump to Obama or Hillary Clinton-and they gave the exact same-the exact same answer Donald Trump gave-we would be screaming unpatriotic (and worse) words at them. But because Trump said it--crickets for the most part." I ask why are there so few conservative and or Republican officials who seem to be afraid to speak out against something so obvious that needs to be denounced? The only thing I can think of is Republicans are afraid that Donald Trump will then tweet something bad about them. Either that or they agree with some of Donald Trump's inane comments, which I find hard to believe. 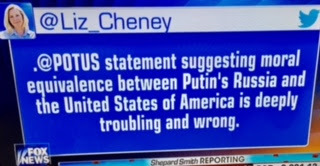 And if they do agree with Trump about America being morally equivalent to Putin's Russia ["You think America is so innocent? "], then they are total hypocrites who rightly spoke out against president Obama's highlighting America's faults to the world. Stop being afraid of Trump's tweets GOP.